Whether you’re interested in learning about renewables for your business or personal use, you’ve probably realised that green energy has developed a language all of its own. Here at powergreen a big part of our mission is to help our readers access the knowledge they need to take advantage of the green revolution. This week we’re going to be cutting through the jargon to give you a comprehensive list of common terms used in sustainable projects. 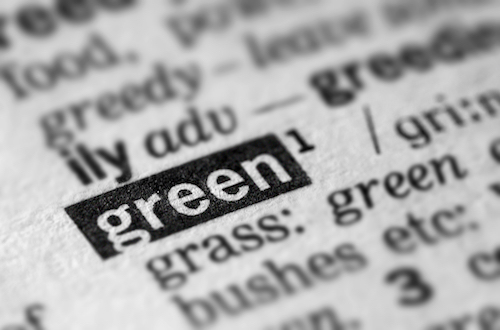 Once you’ve read through this list, you’ll be good to go conversing in this new green language. Before you can dive into the world of green energy, there are a few electrical terms you’re going to need to get familiar with. Don’t worry there is nothing too complicated here, just a little review. AC (Alternating Current) – Alternating current is the most common form of electricity delivered to most homes around the world via large scale grids. It is characterized by a periodic flipping of the direction that the electric charge flows. DC (Direct Current) – Direct current is a type of electricity where the flow of electric charge travels in a single direction. It is less common in power generation but with the growth of renewables (particularly solar) it is becoming more prevalent. Renewable Energy – Energy generated from sustainable resources that can be consumed without depleting the global supply, such as sun, wind, water and geothermal heat. KWh (Kilowatt Hour) – A kilowatt hour is a standard unit used to measure energy production and consumption. Electricity bills are calculated in kilowatt hours and it is used by electricity producers to measure a project’s output. KWp (Kilowatt Peak) – Kilowatt peak refers to the amount of power a photovoltaic system can produce when operating under ideal conditions (full solar radiation). Ideal conditions or Standard Test Conditions are defined to be 1000 watts of solar energy per square meter at 25⁰C. Despite what you might think there’s actually more than one type of solar energy out there. Here we’ve listed three of the most common technologies so you choose the one that’s right for you. BIPV (Building Integrated Photovoltaics) – A term used to describe the use of photovoltaic materials in place of conventional building materials. This technology is often implemented for the construction of roofs, skylights, and building facades and enables structures to generate their own electricity. CSP (Concentrated Solar Power) – These are solar based systems that use mirrors or lenses to concentrate a large area of sunlight (solar thermal energy) onto a focused point. This thermal energy is then used to drive turbines or other mechanical power generation systems. PV (Photovoltaics) – PV is a type of technology that converts solar energy into electricity through the use of semiconducting materials. These materials have the ability to absorb solar energy (photons) and convert them to electric current (electrons). Just like technologies, the types of renewable energy projects vary a great deal. Understanding the terminology will help make sure you don’t run into any surprises with your green solution. BOO (Build, Own, and Operate) – A specific project model where public and private entities partner to complete an energy project. The private entity takes on the responsibility to build and maintain the project while the public (often government) entity provides other financial incentives such as tax exempt status and land subsidies. IPP (Independent Power Producers) – These are independent entities (not a public utility) that own and operate their power generation facilities and sell to utilities and end users. Microgrids – Microgrids are modern, small-scale grids that allow localized electricity generation and consumption close to the site of production. PPA (Power Purchase Agreement) – A power purchase agreement is a contract between two parties; a seller who generates electricity and a buyer who is looking to consume electricity. A solar setup is good for the environment but it can also be good for your bank balance. Countries around the world offer energy buyback programs that can turn your solar project into a money maker. Clean Energy Cashback – A common name for government subsidy programs that encourage renewable generation of electricity; also referred to as feed-in-tariffs. Feed-in Tariff – A government backed financial incentive used to encourage the installation and maintenance of renewable electricity generation projects. Feed-in-tariffs have been introduced across the world and remain a powerful tool to grow renewable energy. Net Metering – Net metering is a system that monitors both electrical consumption and production. It allows consumers who are generating excess electricity to add that electricity to the grid in exchange for a credit on their bill. When exploring renewable energy solutions you’re going to come across a range of certifications. We listed a few of the most important ones here to bring you up to speed. EPC (Energy Performance Certificate) – An energy performance certificate is a verified document, that rates your home or business for energy efficiency. Buildings are rated on a scale of A to G and the certificates will often provide guidelines to improve energy efficiency. GSAS (Global Sustainability Assessment System) – A green building certification system that was created for the Gulf Cooperation Council (GCC) countries. This expanded certification system was developed after the QSAS (Qatar sustainability assessment system) reached wide acceptance across the GCC countries. LEED (Leadership in Energy and Environmental Design) – LEED is one of the world’s most popular and highly recognized green building certification programs. It was developed by the US Green Building Council and has become a nationally accepted framework for designing, operating and constructing high performance green buildings. Estidama – Estidama is a design methodology for constructing and operating buildings in a more sustainable manner. The framework plays a pivotal role in the ‘Abu Dhabi Vision 2030’ to reach the highest standards for green infrastructure across the emirate. Pearl Rating System – Pearl is a green rating system developed by the Abu Dhabi Urban Planning Counsel. The system provides unique guidelines for communities, buildings, and villas and fall under the broader Estidama initiative. Don’t let the title fool you, the terms here are just as important and come up just as often as the earlier ones. Inverter – An electronic device used to convert direct current (DC) to alternating current (AC). They are commonly used in renewable projects to allow them to integrate with the larger regional grid or directly power domestic appliances. Retro-fit – A retro-fit occurs when an existing structure is upgraded with a range of green products. It tends to be more expensive to retro-fit, as complicated systems such as plumbing and HVAC may need to be changed. Smart Meter – A tool used to record electricity use in real time and communicates consumption habits to both the user and utility company. They allow utility companies to better understand regional trends and help users monitor their electricity usage and cost. Are there any terms you’ve come across in your research that you’d like to contribute? Be sure to reach out on Facebook or Twitter and let us know. You can also subscribe to our newsletter here to make sure you never miss a post.